Many users from all over Neopia hope to someday own one of the rare and elusive UC pets, and become one of Neopia's elite, but for many this is just a faraway dream. So what are their favorite UC colors? To answer that very question, I took it upon myself to do a little research. I made about seven boards over the course of four days on the PC and HC, and scrounged up a total of 201 votes. The results were startling! There were five colors with significantly more votes than the rest. And here, fellow Neopians, is where the countdown begins. Coming in at fifth place, Darigan takes home 27 votes for their fierce looks and dazzling red eyes. Why this fearsome fashion statement of a color has earned Darigan a place in the Top 5 is beyond some-- but not all. 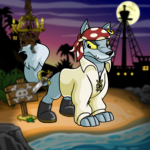 "Even the Darigan pets were cute-ified during the conversion" said krohno, a Neopian who posted on my board, "I think UC Darigans are one of the few remaining glimpses at a darker side that the site used to have." Other users have suggested other reasons as to why UC Darigan pets are so popular, which include the fact that some of them look capable of committing numerous sinister crimes, and how they look menacing, but manage to appear elegant at the same time. Their purple base color won me over, but that doesn't really matter now, does it? So, with our 5th place winner here and gone, we now know why the horrific Darigan pets have earned a place in the Top 5. They definitely deserve it with their colorful attitude and menacing looks-- now let's move on to #4! Surprising most, Faerie has come in at 4th place, barely beating Darigan with a grand total of 29 votes. So why has Faerie, a high-tier, gorgeous UC color that is loved and cherished by many, barely come in at fourth place instead of ranking 2nd or 3rd? "They just look so joyful and pink!" said a Neopian who shall remain anonymous. "I mean, what's not to like; they have wings!" To answer the anonymous person's rhetorical question, I made a board. Some people suggested that some UC Faeries, like the Aisha, have very few colors, the only attributes that make some of the Faeries unique are their poses and wings. If someone stripped those things away, you would have a boring pet sporting different shades of pink. In other words, the Faeries are too girly and repetitious for some. Don't get me wrong, a lot of people (including me) LOVE their pinkness and joyful facial expressions-- otherwise, they would not be here on the Top 5! I mean, what's to expect from a formerly pink, fluffy and girly wonderland in the sky? On that note, let's proceed onto our third place color in the countdown. Congrats, UC Greys, you have successfully made it into the Top 3! Unfortunately, not even a shiny bronze trophy is capable of putting a smile on these sad little creatures' faces. Looking at the JubJub above, some of you may be asking yourself, "Why do I find these depressed pets so adorable? I mean, that's just immoral..."
However, there is no need to fret-- for it is pointless to question yourself. There are plenty of people on the boards to answer your questions FOR you! 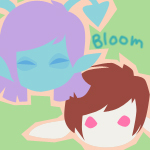 Silly Neopian. "Their body posture really brings it all home." said brutalwolf, an experienced pet trader. "It's one thing to have a sad face, but when your body looks sad as well, that's a totally different thing." Brutalwolf is absolutely right; the UC Greys wouldn't be nearly as irresistible without their drooping ears and big sad eyes. 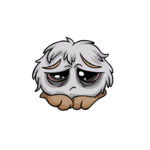 Another Neopian suggested another source of their cuteness is that they look genuinely depressed, which complements their gloomy base color. Phew, what a relief! It's good to know that we don't just adore Greys because they look absolutely miserable-- after all, that would be just wrong. Now onto our 2nd place winner! I have to say this was to be expected-- Royal has won 2nd place by a landslide with a grand total of 42 votes, and a dazzling, jewel encrusted silver trophy. So, what about these pets, with their two-legged stance and large ego is so appealing to the eye? 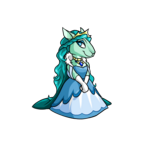 "I just like how dainty and delicate the royal girls look, while the royal boys look valiant, as they should be," said daughter_mom3311, a Neopian who voted for UC Royals in the poll. I agree with her-- the Royal girls look elegant and petite, while the boys look rather courageous and self-righteous. However, I believe they are also so popular because they are very rare, and their two-legged stance, clothing and facial features look very human. 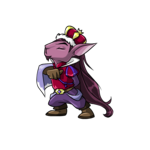 For example, the Royal boy Kyrii have goatees, and the girls actually look like they have hair! Not to mention, the dresses and outfits are just so lovely! And now, for the moment we have all been waiting for-- brace yourselves for the superiority and splendor of... . THE FIRST PLACE WINNER! We've seen the ups and downs of four other colors-- Darigan, Grey, Faerie, and Royal, which has led us to this very moment. What color could rank higher than Royals, with a total of 46 votes? 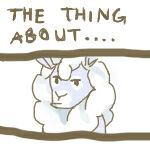 Anyways, let's here what the rest of the world has to say about Plushie pets! "They look so squishy and soft, Plushies remind me of my childhood toys!" said cutypie349514, a fellow Plushie lover. Once again, I concur-- except I'm pretty sure UC Plushies are cuter than my stuffed animals ever were! In my almost two years lurking the PC and HC, I have never heard anyone complain about the old Plushie pets. Ever. They are simply perfect in my opinion. I mean, sure, the Quiggle and Techo are kinda creepy, but they're still cute! Also, some people on the boards have suggested that the Plushies are so adorable because of their bright, happy colors, stitching, button eyes. Basically, everything that makes them look like cheerful, squishy stuffed animals adds to their popularity. With the countdown done, and the Top 5 colors revealed, you are now well-informed about the top UC pet hierarchy! If you are reading this article, I am proud to say that this is my very first time in the Neopian Times! This was a fun way to spend my spare time, and I sincerely hope you all had fun reading it. I hope to submit more articles in the future, but until then-- ciao, and don't forget to give UC Mutants a chance as well! Finally, the day has come to paint your beloved pet. But which color? Here's your guide!